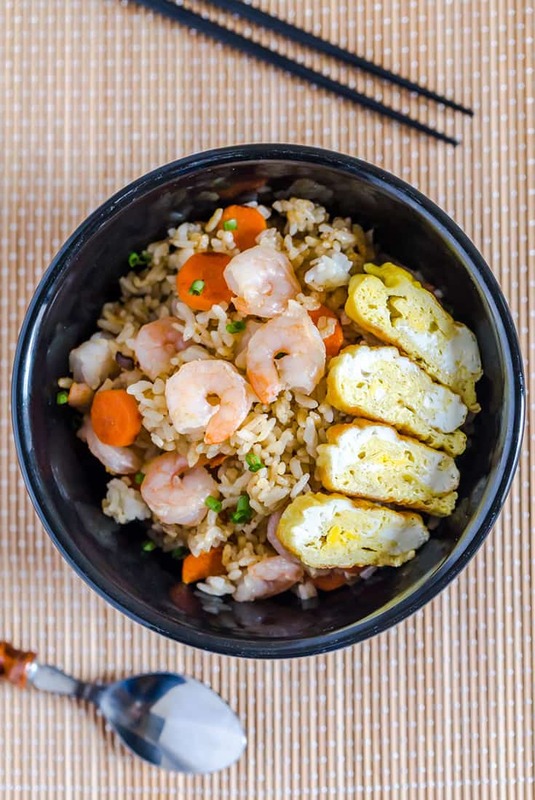 If you have some leftover rice on hand or are craving of something more exotic, try this Japanese fried rice recipe. 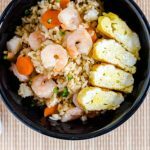 Fried rice is great as a main entrée with salad and sauté or it can be served as a side dish along just about anything. 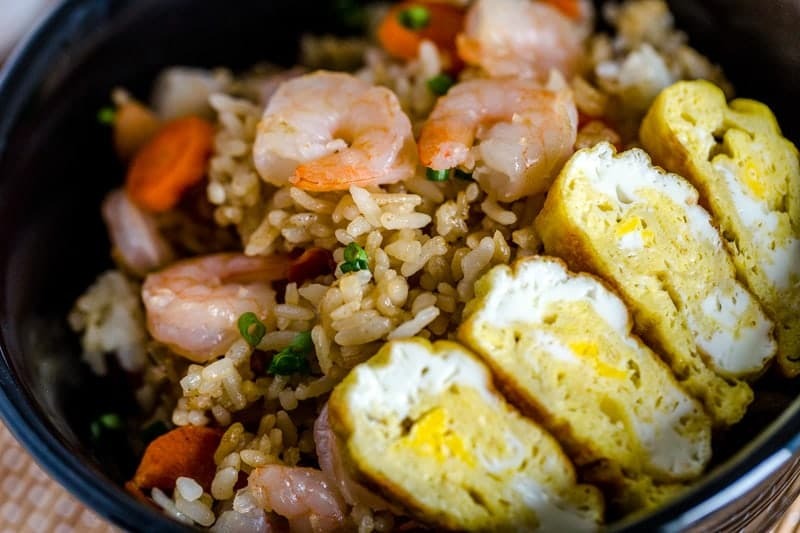 The Japanese fried rice recipe below is perfect for 4 people as a side or for 2 people as an entrée. It includes vegetables and protein to round out the dish as well. 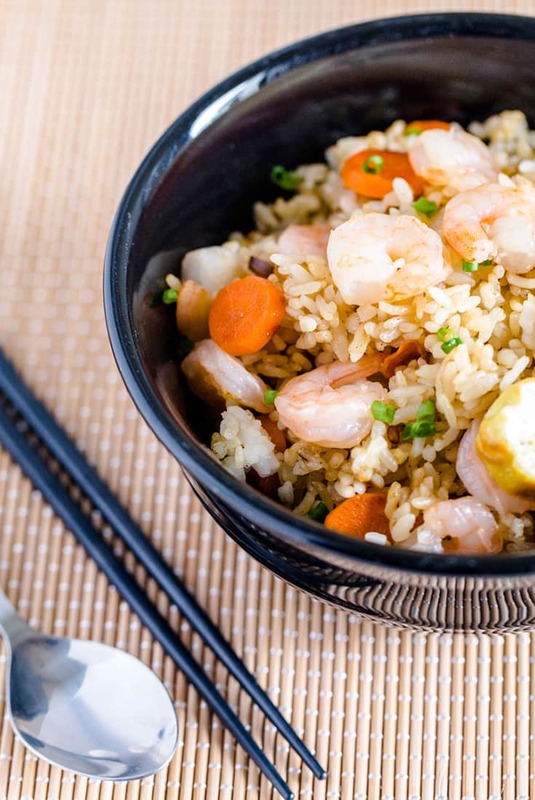 Fried rice can be made from either brown or white rice. Though traditional and more authentic Japanese fried rice dish is cooked from long grain white rice. This produces dryer and crispier texture to the outcome. Basmati or Jasmine rice will also work well. Brown rice generally cooks by simmering 2 cups of rice in 2 cups of water for 40 minutes. White rice cooks faster at 2 cups of rice in 3 cups of water for 15 to 20 minutes or per packaging direction. They can be cooked with direct heat (stove top) or with the help of a rice cooker. If you are fortunate enough to own a rice cooker, this will make your rice preparation more precise and easier. To yield 3 cups of cooked rice you will need to add 1 cup of dry rice and 1½ cups of water to the rice cooker or per the imprinted guideline. This recipe calls for shrimp, however, feel free to substitute any items if you have food allergies or dietary restrictions. Here are some ideas. For the shrimp you can use cubed chicken thigh, thin sliced pork or beef. Better yet, try sausage, hot dog, ham, etc. ; just chop them to ½ inch cubes. For the eggs substitute 1/3 cup firm tofu diced small. Vegans? Use a little more oil and no butter (or imitation butter), and substitute shitake mushrooms and tofu in place of the animal proteins. Bring a wok or cast iron skillet to medium-high heat. Have your vegetables prepared and your eggs whisked. When the wok is hot add 1/2 the butter. Pour the eggs in and turn the pan to coat with a single layer of egg, similar to a pancake. Don’t scramble. The eggs will set in about 1-1/2 minutes. Remove the eggs to a cutting board. Add the grapeseed oil and the rest of the butter to the pan. Place the carrots, scallions, onions, and garlic in the pan. Cook this for approximately 3 minutes. Turn the heat up a notch and add the shrimp. Toss through quickly. Add the rice and the sesame oil. Toss through again. Then add the tamari and mirin. Cook this for another 3 minutes on high heat. Meanwhile, roll up the flat egg, like a cigar, and slice thinly. Add this to the rice right before serving. Season with a little salt and pepper. Serve the rice while it is hot. 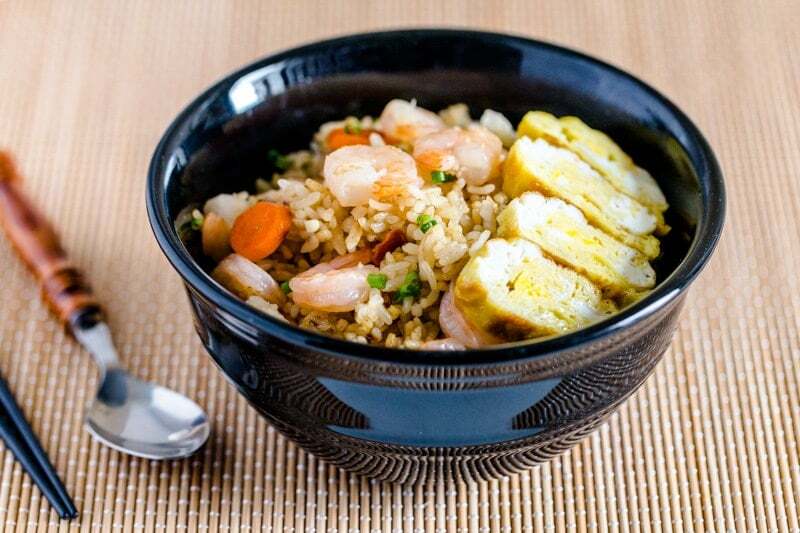 If you liked this recipe for Japanese Fried rice, you might enjoy some of these other recipes. 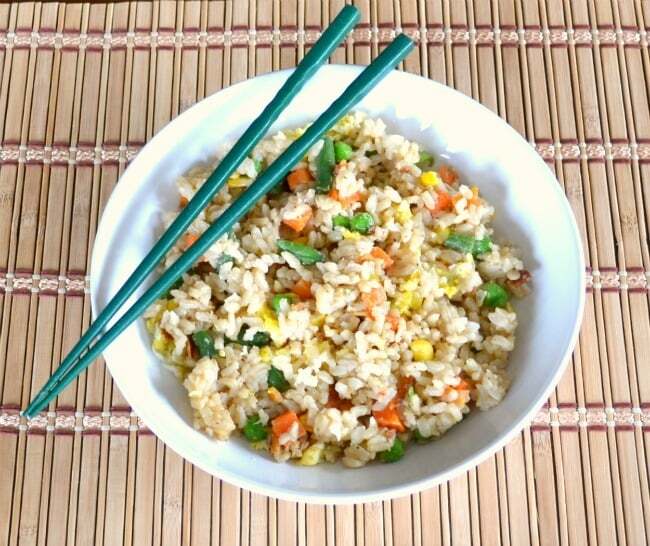 For Meatless Mondays, try this Veggie Fried Rice. 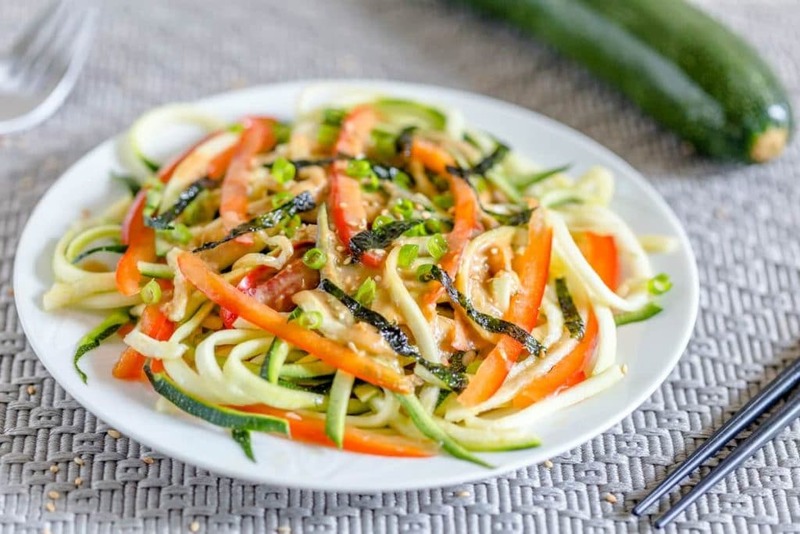 On warmer days, you might prefer this Japanese Zucchini Noodle Salad with Miso Dressing. 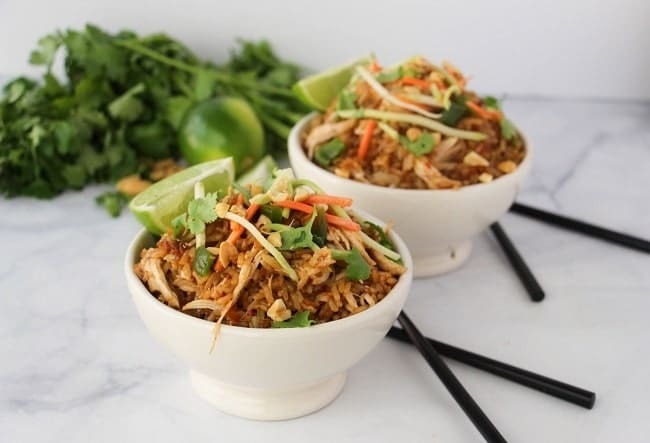 If you have an Instant Pot, you can make these Thai Chicken Rice Bowls. It’s one of my most popular recipes.